Once, during the age of legends, the Goddess of Chaos was said to have brought about a great flood that covered the world, and was said to be responsible for all the disorder that exists among all living things. 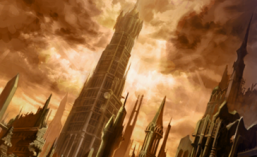 However, in truth the great flood came about due to the Goddess Ashunera, which Yune exists as the “chaotic” side of. Naturally, Ashunera detached the part of herself which caused so much death in the form of an immature child. This became Yune. 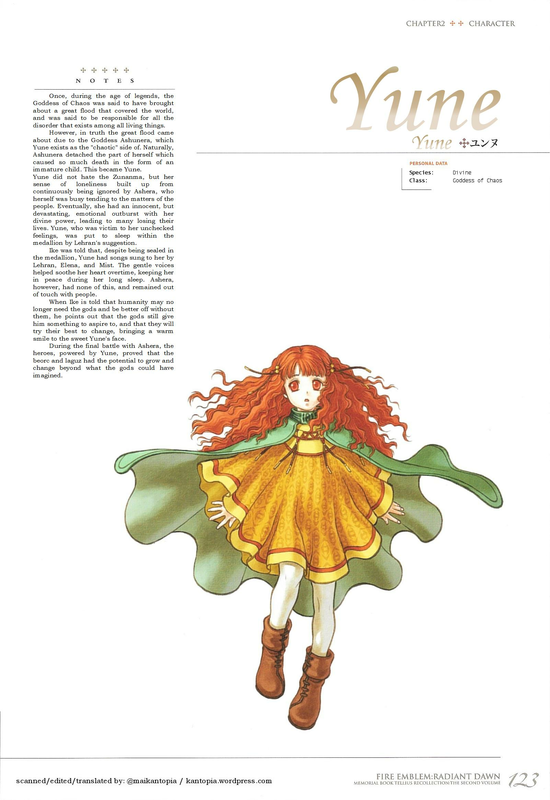 Yune did not hate the Zunanma, but her sense of loneliness built up from continuously being ignored by Ashera, who herself was busy tending to the matters of the people. Eventually, she had an innocent, but devastating, emotional outburst with her divine power, leading to many losing their lives. Yune, who fell victim to her unchecked feelings, was put to sleep within the medallion by Lehran’s suggestion. Ike was told that, despite being sealed in the medallion, Yune had songs sung to her by Lehran, Elena, and Mist. The gentle voices helped soothe her heart overtime, keeping her in peace during her long sleep. Ashera, however, had none of this, and remained out of touch with people. When Ike is told that humanity may no longer need the gods and be better off without them, he points out that the gods still give him something to aspire to, and that they will try their best to change, bringing a warm smile to the sweet Yune’s face. During the final battle with Ashera, the heroes, powered by Yune, proved that the beorc and laguz had the potential to grow and change beyond what the gods could have imagined. This entry was posted in Artbook, Fire Emblem, Translation, Video Games and tagged background, character, character design, concept art, english, Gamecube, guidebook, intelligent systems, japanese, memorial book, nintendo, path of radiance, profile, radiant dawn, tellius recollection, Trivia, yune. Bookmark the permalink.